With just nine days remaining until opening day, the CAA Harbin Ruijing Carving Team of master ice carvers from Harbin, China are adding the finishing touches as the work of over 100 towering ice sculptures are completed at ICE LAND: Ice Sculptures, A Caribbean Christmas. Beautiful coral, a wide range of marine life ranging from spinner dolphins and other fish, a giant hammerhead and Kemp’s Ridley sea turtles as well as the finishing details at Shiver’s Ice Bar, the Oil Rig Ice Slide and more with Christmas theming throughout are the nuances that will provide a unique experience unlike any other for visitors to enjoy this holiday season when the attraction opens November 12. 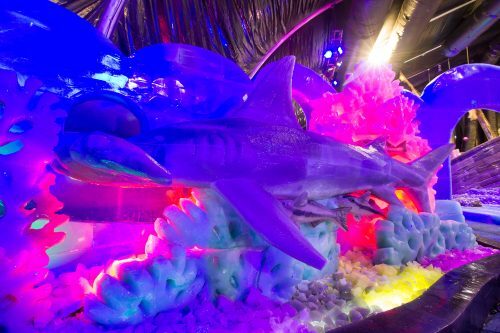 In its third year, ICE LAND will have guests embark on a breathtaking underwater journey from the shores of Galveston Island through the Gulf of Mexico. As they explore the oceans depths, they will discover sunken treasure and see Christmas surprises along the way. An ice slide takes the form of a towering oil rig and gives an opportunity to venture through the beautiful Flower Garden Banks National Marine Sanctuary for encounters with spectacular schools of colorful tropical fish, eagle rays, turtles, dolphins, hammerhead sharks and more on the way to their Caribbean island destination. ICE LAND will offer a unique holiday experience for the entire family and will be open November 12 through January 8, as Galveston makes its transition into the Winter Wonder Island. Admission for adults is $26.95, $21.95 for seniors and $15.95 for children. A Value Days discount of $5.00 is available Sunday through Thursday, November 13 – December 15 and January 1-5 excluding Thanksgiving Day. Festival of Lights admission is $10.95. Additional combination tickets such as the Holiday Pass are available online for $34.95 and offer admission to ICE LAND, Festival of Lights, plus one attraction. Special packages are available for groups of 20 or more. Hotel Packages are also available. 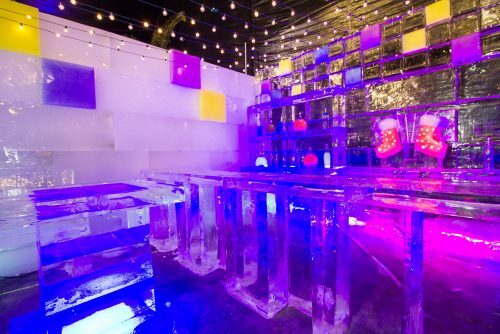 In addition to ICE LAND: Ice Sculptures, A Caribbean Christmas, Moody Gardens will be home to seven other holiday attractions this season. Guests can take a stroll through the Festival of Lights, a one mile walking trail that features hundreds of light displays, including the area’s only outdoor ice rink. They can also enjoy the Arctic Slide, train rides, a variety of holiday and traditional films at the MG 3D theater, and a new Rudolph the Red Nosed Reindeer Experience at the 4D Special FX Theater. The Rainforest, Aquarium and Discovery Pyramids will also be open. A Holiday Buffet will also be available nightly. The Holiday Gift Market will be featured at the Moody Gardens Convention Center Thanksgiving Weekend and guests can enjoy the new Cirque Joyeux Noel Dinner & Show December 16 – 26 at the Moody Gardens Hotel. For more information call 1-800-582-4673 or visit www.moodygardens.org . Posted on November 3, 2016 Author Moody GardensCategories ICE LANDTags Christmas, Christmas events in Texas, Holiday Activities, Holiday attractions, ICE LAND, Ice SculpturesLeave a comment on Your Caribbean Destination Awaits! Texas Two-Step Celebration: This party package includes a BBQ buffet featuring sliced brisket and sausage, baked beans, potato salad, and Texas toast. Price is $35 per guest. Yuletide Fiesta: Upgrade to a beef and chicken fajita buffet featuring southwest pinto beans, Spanish rice, peppers and onions, flour tortillas, pico de gallo, sour cream, and guacamole. The Yuletide Fiesta package is $40 a person. Each buffet includes cookies for dessert; iced tea, water, and 2 drink tickets for beer, wine, and soft drinks. We cater and provide a full bar service for your parties. Our experienced and professional event staff will take care of all your needs from set-up to clean up. Our banquet room can seat up to 80 people and there is on site free parking. Talk about stress-free party planning! All prices are inclusive, and there is a 20-person minimum. 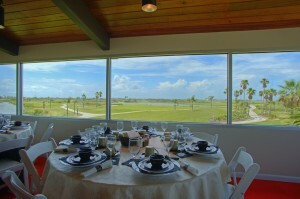 For more information contact Anja Borski at 409.683.1200 or aborski@moodygardensgolf.com. Moody Gardens Hotel and Attraction is the perfect holiday destination for events in Galveston with our holiday lights festival. Start planning your holiday party with us today, and hurry, because rooms will get booked quickly. Don’t miss out on our special holiday offer. Receive a Festival of Lights Arctic Package for only $17. 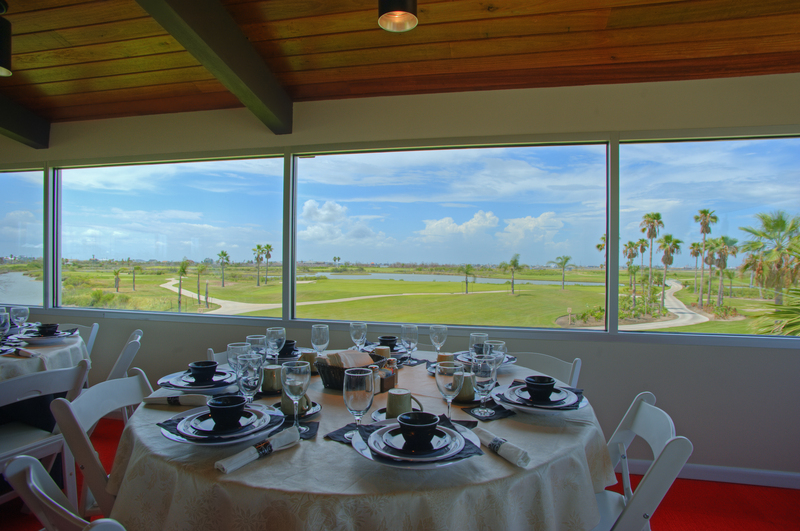 We also have special holiday deals going on at the Moody Gardens Golf Course and the Spa at Moody Gardens! Feel like you are a part of the movies in the Moody Gardens 3D Theater. Once you put on your 3D glasses you will experience the realistic three-dimensional images projected onto a gigantic six-story screen. This season experience the documentary, To The Arctic 3D. This heartfelt film takes you through the journey of a mother polar bear and her two seven-month old cubs across their icy home. It’s a story of love, survival, and adventure on the majestic Arctic. The beautiful scenery and captivating images are presented in breathtaking IMAX® 3D, giving viewers an up-close view of the immense glaciers, massive snow-bound peaks, and spectacular waterfalls. While the imagery of To The Artic 3D is incredible, so is the story that accompanies it. Meryl Streep brings beautiful narration to this tale of a land far away with exotic animals you wouldn’t normally be able to observe in their natural habitat. 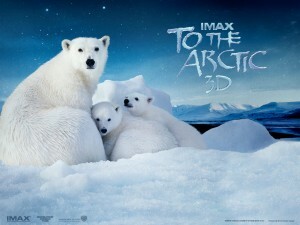 To The Arctic 3D is the perfect film for you and your family to enjoy this season. With the 3D imagery, you will feel as if you are exploring the Arctic yourself, but without the below-freezing temperatures! The family friendly story is pleasing to parents and kids alike. The documentary is also an educational experience, and an opportunity to learn more about Earth’s vast variety of environments. To learn more about To The Arctic 3D check out the official trailer here. Want to see this awesome documentary and go to the Festival of Lights? Then check out our Limited Time Festival of Lights Arctic Package for only $17! The package includes admission to the famous Festival of Lights, the Aquarium Pyramid, and the To The Arctic 3D documentary. Moody Gardens presents the biggest holiday lights festival in the region, with family entertainment and great holiday discounts. Be sure to check us out for your Galveston and Houston holiday events this year, and don’t miss out on our latest holiday deals for your Christmas events in Texas! During this year’s Festival of Lights, Moody Gardens is bringing in a new holiday experience: snow tubing! Texas doesn’t have a lot of snow or sledding opportunities, especially down by the Gulf coast. However, with this addition to the arctic fun at Moody Gardens, even Texan kids can experience this fun winter past time. Glide along the ice and into the holiday season. Snow tubing features a 100-foot ice slide set up in the Moody Gardens grounds. Guests will glide down the giant ice slide on a tube, experiencing an icy thrill unlike any in the region. Snow tubing is fun for almost all ages! The gravity propels the tubes down the slide at exhilarating, yet safe, speeds. Since there aren’t many snow-covered hills in Texas, it is hard to experience this kind of holiday fun without traveling up north. Now you can have snowy hills and Gulf coast beaches, all in the same vacation. From over a million lights to giant ice slides, you can’t find a holiday experience quite like the Festival of Lights. The snow tubing will start on Saturdays during the Festival of Lights (November 10-December 5), and then open daily from December 22-January 5. The hours are noon to 10pm, and admission is only $12.00. You and your family will have plenty of time to get down to Moody Gardens to experience this new seasonal attraction. Snow tubing is just one of the many fun holiday events in Texas going on at Moody Gardens this season. The holiday lights, Christmas events in Texas, and other attractions are constantly entertaining all our visitors. Plan your next family holiday at Moody Gardens, and plan to stay at the Moody Gardens Hotel. Enjoy our special holiday deal, a Festival of Lights Arctic Package for only $17! Also, don’t miss out on the ice skating in the area’s only outdoor skating rink, here at the Moody Gardens! At the Festival of Lights you can experience the sights, sounds, smells, and flavors of the holidays. The Holiday Buffet covers the tastes and smells with its delicious variety of holiday soups, salads, entrees, accompaniments, and desserts. The Holiday Buffet is the perfect place for date night or a family outing. With two delicious options for the kiddos (Spaghetti Marinara and Mac & Cheese Supreme) the whole family is bound to be satisfied with this holiday feast. The Holiday Buffet is the perfect way to start or finish your visit to the Festival of Lights. You can fuel up on all the different delicious foods offered, such as the Pasta Shells with Ricotta over a Bed of Tomato Basil Cream Sauce accompanied with Grand Marnier and Cinnamon Glazed Carrots. Follow your meal with one of our Chef’s assorted desserts. Yum! The Holiday Buffet is a great place to take out-of-town guests who are in for the holidays! You don’t have to do any of the decorating, cooking, or cleaning. Leave it all to us to feed your guests a delicious meal during their stay. The buffet is also a great option if you are already at Moody Gardens exploring. You don’t have to drive, park, and wait at another restaurant. You can just stroll right into The Garden Restaurant. It’s not just a meal; it’s a seasonal experience for everyone. The Festival of Lights Buffet is served only on nights the Festival of Lights is open. It also excludes Thanksgiving and Christmas due to the special holiday menu on those days. The price of admission for adults is $15.95, and for children ages 5-12 is $7.95. Take a look at our delicious menu! 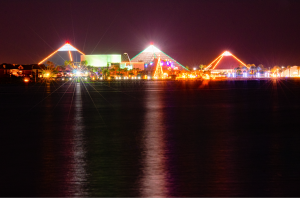 If you’re looking for Galveston or Houston holiday events, look no further than Moody Gardens. Our holiday lights festival is the perfect family entertainment this season. Don’t miss out on our Festival of Lights Arctic Package deal for your family weekend getaways in Texas this season. Be sure to check out the family friendly accommodations at the Moody Gardens Hotel. If you’re only going to go to one holiday festival this season, make sure it’s the Moody Garden’s Festival of Lights. This holiday celebration is one of the largest in the area. The entertainment is nonstop, making Festival of Lights a holiday tradition for many families. 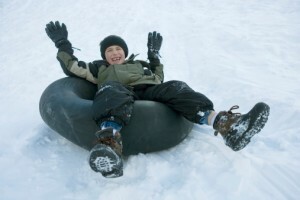 Experience even more holiday fun this year with the addition of snow tubing! Ride down a 100-ft ice slide set up in the Gardens. Snow tubing is open from noon to 10 pm on Saturdays, November 10 through December 15, and daily December 22-January 5. Admission is $12.00. On Friday nights, if you bring a non-perishable food item, you’ll get 2 for 1 admission to the Festival of Lights. The food drive proceeds go to the Galveston County Food Bank. So while you’re enjoying the holiday entertainment, you’ll also be spreading the cheer throughout the community. Dive into a holiday feast at the Festival of Lights Holiday Buffet in The Garden Restaurant. The buffet has options for the whole family, including a special “Kid’s Favorites” section. The buffet is served on nights the Festival of Lights is open. Master Illusionist Curt Miller and friends bring A Magical Christmas Dinner and Show to the Moody Gardens during the Festival of Lights. The dinner and show are held in the Moody Gardens Convention Center on December 17-20 and the 20-27. The admission price includes a buffet dinner, performance, Festival of Lights ticket, tax, gratuity, and parking. You don’t want to miss this fun family friendly event! Get your tickets today! The holiday lights and Houston holiday events at Moody Gardens are the best way to spend your family vacation this year! Don’t miss out on these events in Galveston and our special holiday deal, a Festival of Lights Arctic Package for only $17! 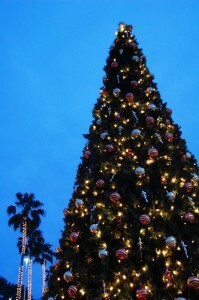 Moody Gardens is the place to be this year for Christmas events in Texas!